Guwahati, the capital city of Assam is one of the popular tourist destinations in India. While the greenery mesmerizes you, the unique lifestyle of the tribes takes you in a different world. Experience the North Eastern Wilderness is Awesome. One of the must do activities at Guwahati is checking out the flora and fauna at the Manas National Park and Tiger Reserve. A UNESCO World Heritage Site, this national park is a safe shelter to mammals, birds, and reptiles. While the ferocious tigers are found relaxing under the cool shadows of trees, baby elephants are found playing in the water of the jungle. The joyous chirps of birds fill the air of the forest, Bengal florican, hornbills, and eagles are some of the avian species found here. Another famous wildlife park of the state is the Kaziranga National Park. Besides its breathtaking natural beauty, the park is the safe habitat of the great rhinos. Enjoy a jeep safari through this dense forest land to check out the grazing herds of elephants, hunting tigers and much more. The oldest Shakti Peetha, the Kamakhya temple is a seat of Tantric Hinduism. Located at the Kamakhya Hill on the banks of River Brahmaputra, this temple complex houses several temples, like that of the 10 Mahavidyas. The Ambubachi Fair is one of the most happening events of the temple. From hermits to magicians, you can meet various kinds of people at this fair. Located near Guwahati, the Madan Kamdev Temple is an epitome of stone architecture. Dedicated to Lord Shiva, this temple complex exhibits stories from Indian mythology with its numerous sculptures. 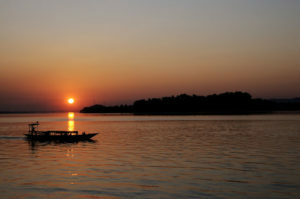 The River Brahmaputra is the lifeline of Assam. This mighty river flows through Tibet and Bhutan into Assam and offers an exquisite natural view. Spend some solitary moments with your loved ones, sailing through the green paddy fields, playing with the colors of sunrise and sunset and enjoying lip smacking meals. There are special cruise packages by Assam Bengal Navigation, which take you through the other tourist destinations of the state, like Kaziranga National Park, Sivasagar, and Dibrugarh. The Majuli Island is another wonder of River Brahmaputra. Known to be the largest river island in the world, this ever shifting maze of sand exhibits aboriginal tribes, varied cultures and floating water meadows. Turn back the pages of history. Guwahati is a historic town. The domed courthouses and the old Guwahati Planetarium are some of the classic structures of old Guwahati. You can also enjoy sky watching at the Planetarium. The Assam State Museum is a treasure house of sculptures, while the tribal culture displays of the gallery exhibit the rich traditions of the state. You can also enjoy some quality time with your family members at the Nehru Park. 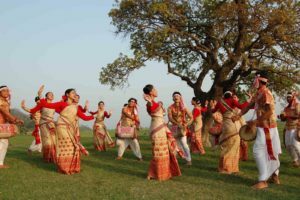 Besides the statues of various dance forms of Assam, like Bihu, Deodhani, Bor Taal and Ojapali, the rock garden and open air theatre are prime attractions of the park. Kids can enjoy different kinds of rides here. Taste the Flavors of Assam. Assam tea is famous worldwide for its aroma and flavor. Get refreshed at mornings with a sip of a cup of steaming hot Assam tea. The hot momos dipped in homemade sauce serves as the best snacks with Assam tea. Savor steaming hot rice with fresh fish curry as lunch, while on special days the locals love to have spicy hot curries of duck and squab. Guwahati has several shopping malls and traditional markets. The city is known for its gorgeous Muga silks. Fill your bags with handmade toys, bell metals, wicker work and bamboo handicrafts to bring back a piece of Assam with you. Hence a vacation at Guwahati brings you close to nature and the avid cultural splendor of North India makes your trip memorable.